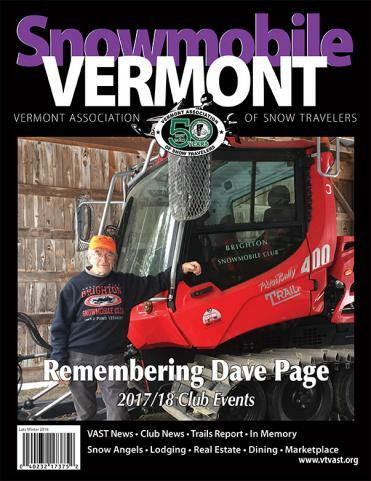 All day event, hosted by the snowmobile clubs of Lamoille county. 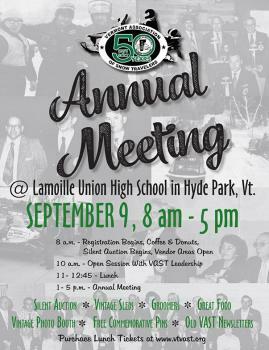 Save this important date and plan to join us for some fun, some looks back at our history and much more. While you do not need to preregister for the business meeting itself, you must buy tickets to the lunch if you plan to be there for that. Tickets are being sold now for $10 per person, or they will be $12 per person after August 31 and at the door. Buy lunch tickets online HERE! The lunch is a BBQ of grilled chicken and ribs, with potato salad, coleslaw, green salad, rolls and butter. A special homemade cake to celebrate our 50th is generously being made by Beverly Lemery. Vendors: : Twisted Obsessions (Jewelry), Scentsy, Hand crafted wooden items (birdhouses, cheese, cutters, cutting boards), Creations by Rachel (personalized items), Fiber optics, goats milk products, Magnabilities (jewelry), hand crafted crochet items, Hand crafted primitive items and more. Sunset Motel Morrisville is offering 15% discount on rooms if you mention VAST 50th upon reserving. Mountainview Campground and S'mores Campground is offering 10% discount, if VAST 50th is mentioned upon reserving. Maplewoods Campground is offering 10% discount on groups of 10 or more people upon reserving if you mention VAST 50th.